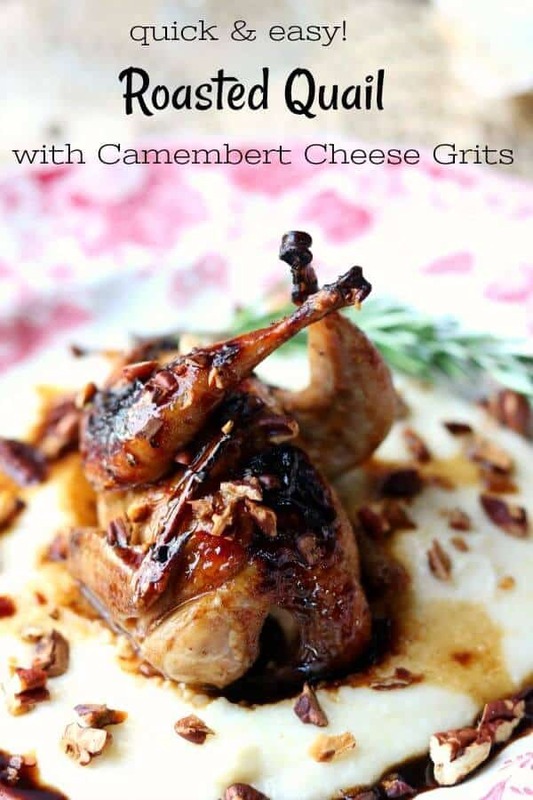 This easy roasted quail with lavender balsamic glaze is served on a bed of Camembert cheese grits. It sounds (and looks) like a super complex dish but it’s not. It’s a romantic dinner that can be on the table in less than 30 minutes. The flavors flow over your tastebuds like a parade of delights – everything from tangy to sweet and crunchy to rich and buttery. Paired with CK Mondavi and Family Chardonnay it’s the perfect romantic meal for two or a cozy, winter Sunday supper. I enjoy creating dishes with kaleidoscopes of flavors and textures. I don’t mind throwing out my brilliant ideas that turned out to be not-so-brilliant and I love when they work out as well as this one did. I’m the gal that will talk to you all day long about spiritual things, nano-technology, and whether or not the Loch Ness Monster is real but gets tongue tied at a party where she’s expected to maintain a conversation that consists of small talk. In other words, I like to put my whole self into anything I do. I’ve always thought of it as the ta da! of my life. So when I was sipping a glass of CK Mondavi and Family Chardonnay I started thinking about France. Then I had a daydream of being at a bed and breakfast in Normandy and what that would be like. 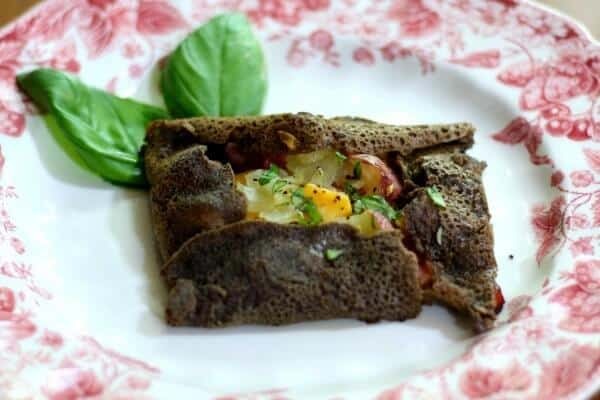 Then I thought about opening a French bed and breakfast in Texas and what the menu would be like. At the same time I was texting with my bestie and told her I was thinking about making quail. We brainstormed back and forth and all of a sudden I knew what I wanted to do. Roasted quail, glazed with a lavender balsamic vinegar and Chardonnay reduction, and served on cheese grits made with Camembert cheese. Toasted pecans would be the garnish and sprigs of rosemary would add a nice scent. 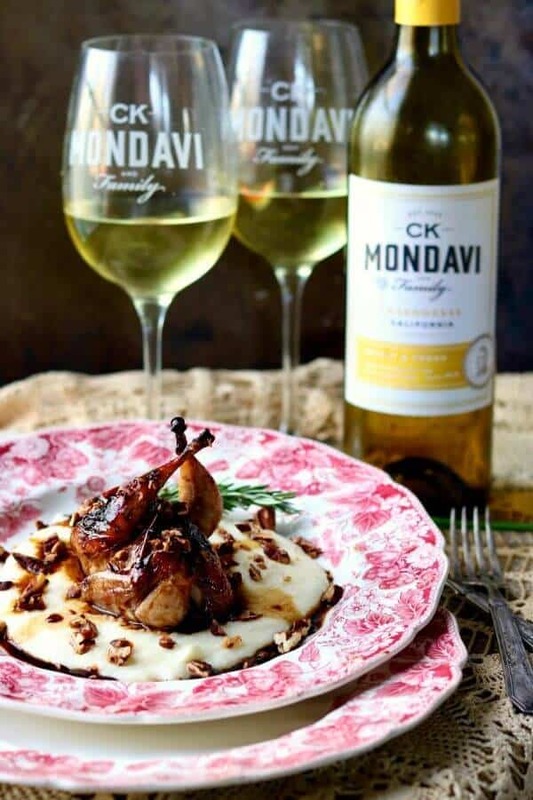 I felt like the bright, fresh flavors CK Mondavi and Family Chardonnay would balance the buttery richness of the grits and sweetness of the quail. Don’t you love it when you absolutely nail something? Quail is a small game bird that is most often found in the freezer section of your store. Most quail nowadays is farmed and only people who hunt get the wild kind. The brand I used was a Texas brand – that raises their quail responsibly and sustainably. That’s another nice thing about using game. It is about the size of your hand and you’ll need at least one per person depending on what else you’re going to serve. It’s the one game bird that I don’t think tastes “gamey”. What does quail taste like? Well I think it tastes like a sweet chicken! You can cook quail any number of ways but I think the best way to cook quail is to roast it at a high temperature for a short period of time. This recipe calls for the quail to be roasted at 500F for 15 minutes and then left to rest. The quail will not be quite done when you take it out of the oven but will finish cooking during the resting time. This keeps the meat juicy – the one thing to watch out for when you’re cooking quail is overcooking which dries the meat out. Done right (and by right I mean my way) the succulent meat of this little game bird will be buttery-melt-in-your-mouth-omg tender. When quail is done the meat is still going to be a little pink. Don’t worry, it’s done. No need to marinate quail but if you really want to you can either brine it for an hour or marinate it in a little olive oil and orange juice with a few slices of fresh ginger and maybe some fresh thyme. Don’t leave it longer than an hour – the fibers in the meat can break down and get mushy. Ew. I like to put a little slice of citrus or fresh thyme (or both) in the cavity just to give it a little more flavor. Rosemary is also good for this. Salt it a little more than you think you should. The salt will balance out the sweetness of the meat. Mine were a tad under salted for most of my family’s tastes. I truss the birds to maintain their shape. To do this just wrap some twine around the legs then back around the body so the quail looks like a tiny Thanksgiving turkey. Since the birds were frozen I wouldn’t refreeze any part of this dish. And really, it’s so easy to make that there’s no reason to. Quail, no matter how gorgeous it looks, is not a pretentious dish – especially when it still has the bones in it. If you’re at home just eat it with your fingers. Pull the legs and wings off first – seriously, a knife and fork are too clunky here. If you’re at a restaurant it’s usually got most of the bones removed – or choose something else on the menu. Trussing a quail keeps the bird shaped nicely and ensures that it will brown evenly. Cut off 16 inches of kitchen twine for each quail. Start with the bird breast side up. Cross the middle of the string over the end of the legs and flip the quail, bringing the two ends to the front of the bird. Make sure that the string holds the wings tight against the body. Make a knot and turn the bird back over, breast side up. 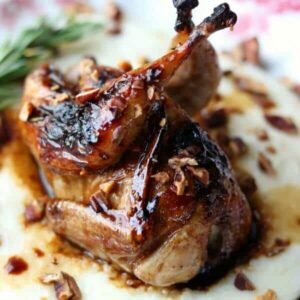 Quail is perfect for romantic dinners because it looks so fancy but it works for family and friends dinners, too. Finish the meal with something citrus and light. Use this menu for inspiration! Stuffed mushrooms – get some umami on this menu! Romaine salad with a vinaigrette made with the same balsamic you used for the glaze – some grapefruit and orange sections with the membrane removed is really nice here. 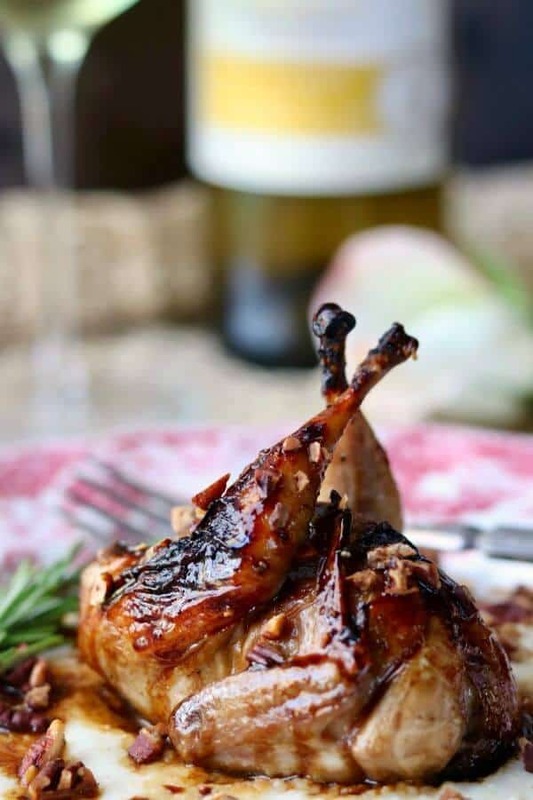 This roasted quail recipe results in a gorgeous, restaurant worthy dish! The glaze is sweet, citrusy, tangy and it makes the skin crispy. 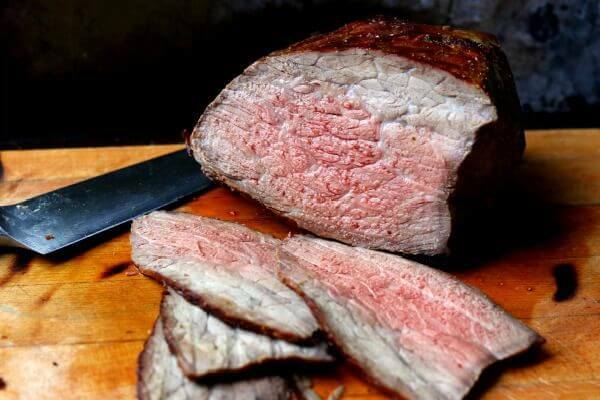 The meat is buttery-sweet and just melts in your mouth with every bite. The grits are perfectly creamy with an earthy saltiness from the Camembert cheese. I toasted the pecans almost to the scorched state – they are crunchy with a little smoky bitterness that I love. When everything is taken together and eaten in one bite then washed down with a sip of the Chardonnay it’s just … wonderful. I think it would be amazing for a cozy evening in front of a crackling fire OR for a romantic Valentine’s Day dinner. Keep in mind that grits are bland and they’ll diminish the flavor of anything you add to them. The Camembert makes them creamier and milder than my Cheddar Cheese Grits. Get a good Camembert that’s good and ripe or the flavor will be lost completely. Of course, you know the old adage, don’t use a wine for cooking that you wouldn’t drink! 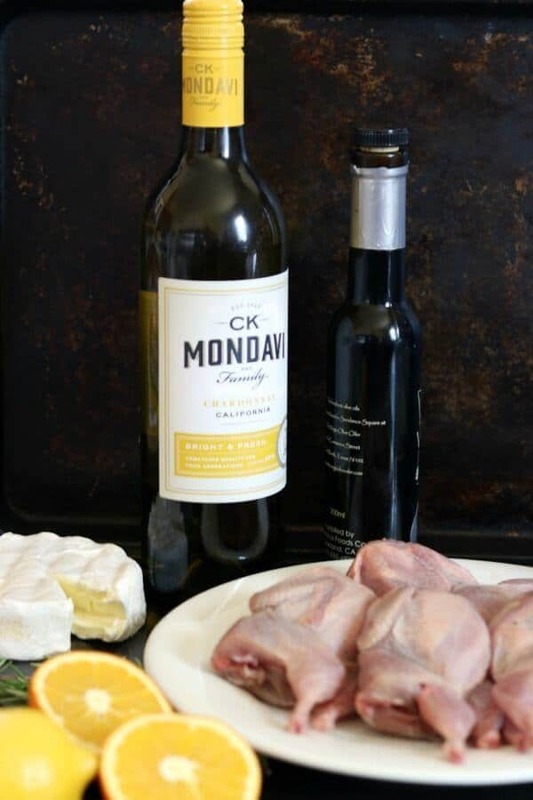 CK Mondavi and Family Chardonnay is the perfect pairing here! Lavender balsamic vinegar is merely balsamic vinegar that’s been infused with lavender. It is slightly sweet and citrusy. You can use regular balsamic vinegar but try it just once with the lavender balsamic vinegar! It so good! You’ll find a link to it on my Essentials for Success Page up on the top of the website. This recipe is for 4 servings but you can adjust the number of servings up or down by clicking on the number and moving the arrow. The ingredient amounts will change to match your desired number of servings. Tender quail is roasted and brushed with a tangy-sweet lavender balsamic glaze. It's served atop decadently creamy cheese grits made with earthy Camembert cheese and garnished with crunchy toasted pecans. Perfect for special dinners or family suppers - it only takes about 30 minutes from start to finish! 4 quail, , whole and bone-in. Thawed if frozen. If the quail is frozen defrost it overnight in the refrigerator. Pat the quail dry with paper towels. Truss the bird according to the instructions in the accompanying post. Place a small sliver of orange in the cavity of each quail and add a little thyme or rosemary. Roast in a 500F degree oven for 10 minutes. Remove from the oven and brush with the lavender balsamic glaze. Return to the oven for 3 to 5 minutes, depending on the size of the quail. Remove from the oven and set aside to rest for 10 minutes, loosely tented with aluminum foil. Add the balsamic vinegar, the chardonnay, the orange juice, lemon slice, and rosemary sprig to a pan - I find that a high sided frying pan helps the glaze reduce faster. Simmer the glaze until it is reduced by about 1/3 (5 to 10 minutes for me) It will thicken as it cools but does not need to be thick to use on the quail. In a large, heavy saucepan bring the water, cream, butter, and salt to a boil. Slowly pour the grits into the saucepan, stirring constantly. Cook according to the instructions on the package, about 5 minutes for quick grits, stirring constantly. Stir in the cheese and continue to stir slowly until the cheese is completely melted into the grits. If the texture of the grits is too thick for you add a little cream. If it's to think cook it a little longer, stirring constantly. 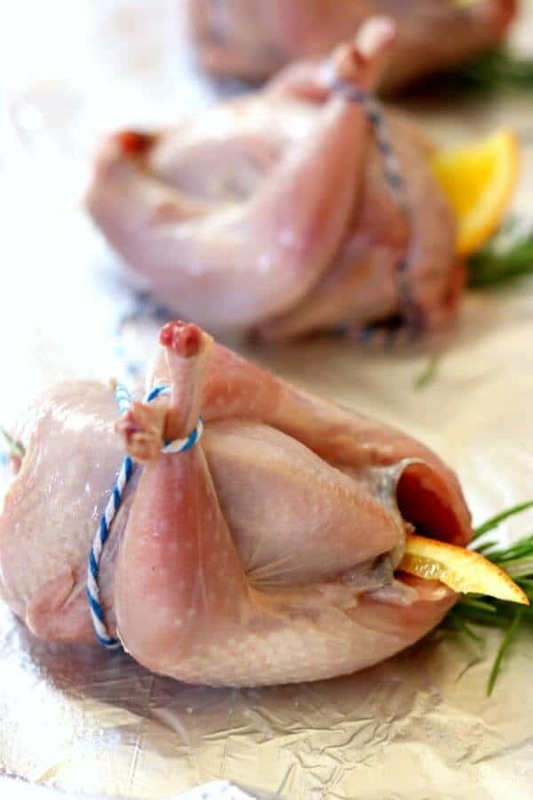 Clip kitchen twine and remove it from the roasted quail. Remove the orange slivers and herbs from the cavity if desired. Spoon a portion of the grits in a circle in the center of a plate. Carefully add the glazed quail. Spoon some more of the glaze over the top. Serve with CK Mondavi Chardonnay. This recipe is part of Meal Plan Monday #93 Check it out. I have never had quail! I saw your video and wow, they are tiny birds 🙂 I’m very impressed and the flavors here sound awesome. I’m going to have to see if I can find quail so we can try it! They are tiny! one is enough for me but some people might need 2. They were so very good!! You took Ta Da to a WHOLE new level!! 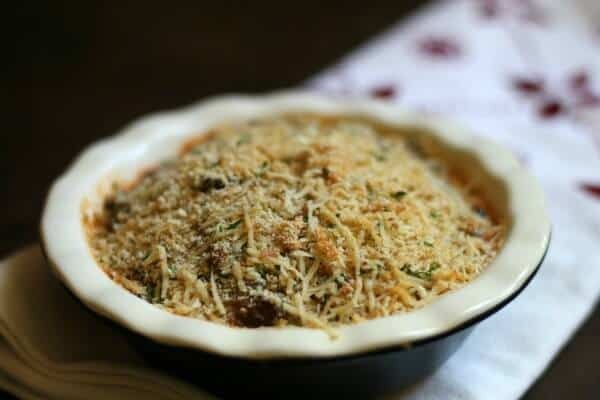 This is a gorgeous holiday dish. I haven’t tried Quail yet, but now I need to find it. I haven’t had quail in a long time — it was some that my brother got when he hunted — so many years ago. I have had Cornish hen and I suppose you could substitute one for the other. I know Cornish hens are easy to find. And I’m all for amore and being with my Tesoro. 🙂 You could use Cornish hens but I think they are milder in flavor so some of the balance would be off. And romance? Yep. All the romance! Right? It does look fancy but it is SO easy.. and honestly my kids were skeptical but one bite had them digging in! It is so good!